Wandering around Wild Place can leave you feeling hungry and we have plenty of places for you to pick up a bite to eat. The Courtyard Cafe - open 10am - 3.30pm every day. The Courtyard Café offers a selection of freshly made sandwiches, toasties and soup. Guests are able to enjoy a cake or tray bake from our bakery range with a barista prepared coffee or tea. We also have a great range of hot and cold drinks and ice creams for all the family. Children visiting can enjoy our Explorers food offer, which includes a picnic bag to fill with their favourite 5 items! All of our options are made using the best local, ethical and sustainable ingredients, all freshly prepared by our team of chefs every day. 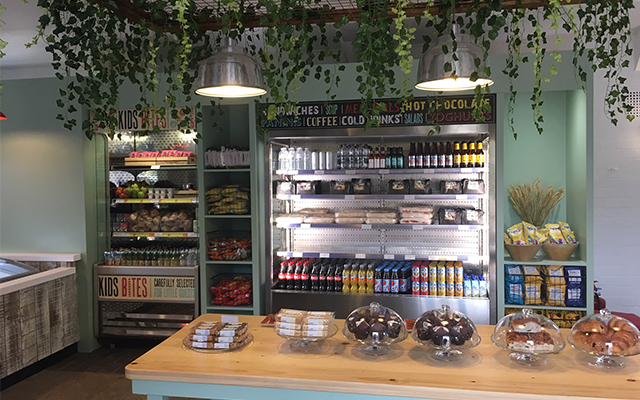 The Courtyard Café is a perfect option if you are looking for a family friendly place to eat in the Cribbs Causeway area and also the perfect stop off if you’re enroute on the M5 to Cornwall or Devon. The kids can let off steam and enjoy what the park has to offer, as well as filling up on our delicious homemade, locally produced food. Have you been to our new Benoue kiosk down by the Giraffe House? Treat yourself to yummy snacks, such as homemade doughnuts, and refreshing drinks! Base Camp Pizzeria - Brand new for 2019! Our newest food and drink offering, Base Camp Pizzeria, is located is just behind the cheetah enclosure with seating that overlooks the cheetahs. Our pizzas are freshly baked in our stone based ovens for a perfect pizza every time. Our meat is farm assured and prepared alongside our other ingredients by our on-site chefs. We also have vegan pizzas and gluten-free bases available, as well as a wide range of hot and cold beverages to suit any weather. Base Camp Pizzeria is only open one weekends and during school holidays. Look out for the notice board at the entrance for updated opening times. Seating is strictly reserved for Base Camp guests only. Other picnic areas are available around site. Please see the site map. Our ice cream parlour is located near Tower meadow and offers a wide range of ice cream flavours from Marshfield Farm Ice Cream, who produce award-winning organice ice-cream on their farm near Bath. They also serve up ice lollies and soft drinks. Our Ice cream parlour is only open one weekends and during school holidays. Look out for the notice board at the entrance for updated opening times. Allergen information available in each of the areas – please ask member of the catering team for our allergen files.